Is there a better feeling than hitting a straight shot down the fairway with your favorite driver off a new tee? Unfortunately, all beginners (and even some masters) break a tee every once and a while. Our new Golf Buddy is there for you when this happens! 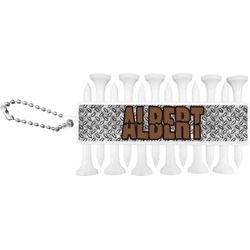 With 12 tees on a lightweight, portable key chain, it almost ensures a great 18 holes. Our tees are made of white plastic and are a little over 2". Design the front and the back of the golf tee holder. Pick from over a hundred designs, colors, and personalization styles! The set even comes with three removable ball markers as well! Simply slip this key chain on your golf bag, and you're set for a nice, relaxing day out on the greens. Start exploring our design center before you get started. Once you're ready, start designing! Feel free to give us a call for any questions or concerns you may have. There's a quick and easy way to become the most coordinated golfer out there - buy our Golf Gift Set! The set comes with a putter cover, golf tee holder, and golf towel of your choice. Pick and choose what designs you want on what products - as usual, it's entirely up to you. Continue browsing our Sporting Goods & Accessories department for all your sporting needs. Grab a personalized water bottle for when you're out on the field all day. Your drinks certainly shouldn't have to go warm, so get our collapsible cooler to keep them nice and refreshing all day!